Although visitors would be hard-pressed to find shark fins in our museum's displays, there is one kind of fin (or, at least, part of a fin) that they can find in our new business history exhibition—this taillight assembly for a 1959 Cadillac Eldorado Biarritz. The assembly itself is beautiful—steep chrome lines punctuated with red, bullet-like taillights—but it's also a classic example of how our curators can use a small object to explore a big topic in U.S. history—in this case, the reason why we buy products designed to be replaced. Tail fins started to appear on American cars in the late 1940s, and while many cars eventually adopted them, most experts credit Cadillac for introducing fins to the public. Cadillac's 1948 lineup debuted with a number of stylistic innovations, but the ones that captured most customers' attention were the small fins that curved up from the rear fender. Although the fins served no practical purpose, they instantly connected Cadillac's luxury brand to the technological wonders that were capturing Americans' popular imagination at the time: rockets and jet airplanes. This association was no accident. Franklin Quick Hershey, the lead designer on the team behind the fins, was inspired to add them after visiting an airfield during World War II and spotting a P-38 Lightning fighter plane. General Motors's chief designer, Harley Earl, initially balked at the fins and demanded that Hershey remove them, only relenting when other parts of the company came to Hershey's support. Fortunately for Cadillac, the tail fins proved amazingly popular. In the decade that followed, tail fins became a signature feature of the company's lineup. Not wanting to be left out, other auto manufacturers added tail fins to their own cars, and soon the fin became a visual motif anyone could spot cruising the nation's roadways. But as the American Enterprise exhibition shows, tail fins were a style with a purpose, and the purpose was simple: sell more cars. As the 1950s began, auto manufacturers faced a major dilemma: an over-saturated market. When World War II had ended, car sales had risen dramatically. Middle-class Americans, after decades of economic depression and wartime rationing, suddenly had money in their pockets and a desire to buy automobiles that suited their prosperous peacetime lifestyle. By the early ’50s, the automobile market was teeming with used cars—so many that manufacturers could only watch with dismay as the sales figures for their new models dropped, sometimes steeply. In order to keep their financial engines running, car makers had to convince customers to upgrade their vehicles year after year, even if the cars in their driveways were still running fine. 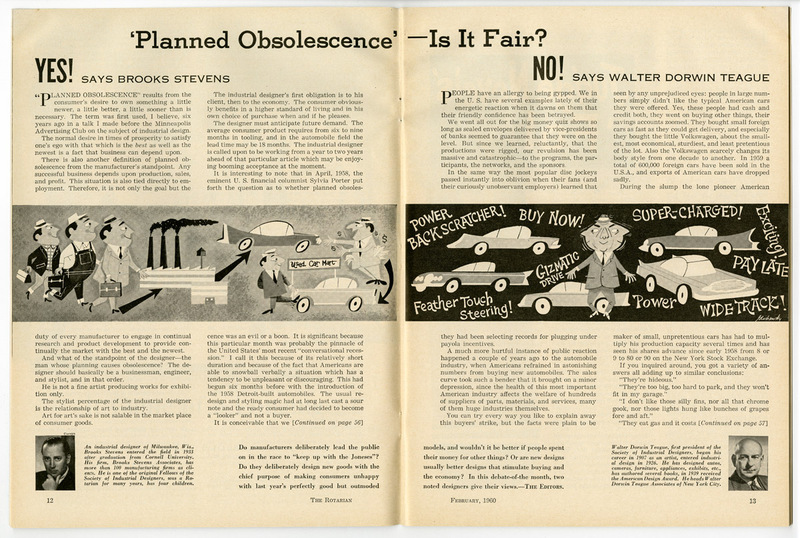 For many companies, including Cadillac, the simplest way to push consumers toward new cars was the time-tested practice of planned obsolescence—creating products that rapidly became obsolete. In the case of cars, manufacturers usually pursued a specific kind of planned obsolescence, what could be best described as "design obsolescence." Every year, auto manufacturers released a new annual model that differed very little mechanically from previous generation but did showcase a dramatically different style. The goal of these style changes was to give customers both a positive and negative incentive to upgrade their cars—the desire for an even more attractive vehicle paired with the fear that others would judge them for sticking with last year's model. Cadillac put its weight behind design obsolescence in the 1950s—quite literally. The company's luxury sedans gradually grew bigger, heavier, and altogether chrome-ier as the decade progressed. And while consumers could see the difference between annual models in any number of ways, the clearest change year to year was the size and shape of the tail fins on each model. When tail fins debuted in 1948, they were modest humps; by the end of the 1950s, they were space-age wings that wouldn't have looked out of place on a rocket-ship. Design obsolescence was hardly a new strategy for automakers. Cadillac's parent company, General Motors (GM), had used a similar technique decades before to jumpstart consumer demand and vault past the nation's then dominant automaker, the Ford Motor Company. Ford had risen to prominence in the automobile market by providing consumers the reliable, low-cost Model T, and at the start of the 1920s Ford's Model T outsold all of GM's models combined. GM's fortunes changed when, under the direction of Alfred P. Sloan, the company fully embraced the concept of annual style changes. By redefining every year's fleet with new colors, shapes, and amenities (and occasionally a few technological improvements), the upstart automaker was able to convince customers to trade in their staid Model Ts for a new GM. By 1927 GM's Chevrolet had overtaken the Model T, and design obsolescence had proven itself as a viable strategy for economic success. Not all Americans welcomed the practice of design obsolescence—a fact that was not lost on Cadillac's rivals. In the late 1950s one of those companies—Volkswagen—differentiated itself from American competitors by highlighting how little its cars' designs changed. 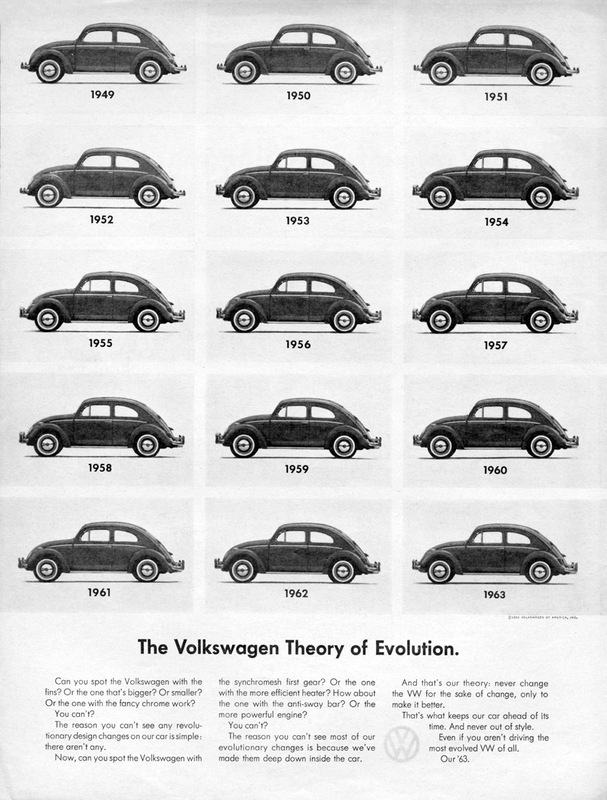 One of the company's advertisements from 1959 assured customers that, although the Volkswagen Beetle "changes continually throughout each year . . . none of these changes you merely see. We do not believe in planned obsolescence. We don't change a car for the sake of change . . . . VW owners keep their cars year after year, secure in the knowledge that their used VW is worth almost as much as a new one." Volkswagen's promise seems to have appealed to American consumers; by 1970, Americans had bought over four million of the company's cars. Ultimately, Cadillac's tail fins were undone by the same forces that brought them into existence. As consumers' tastes changed, the once proud fins receded back into the bodies of Cadillac's sedans. Today, tail fins live on as a symbol of a distinctive era in American life and a reminder of the central place of design in business history. Jordan Grant is a New Media assistant working with the American Enterprise exhibition. He has also blogged about the history of one of our favorite board games.